Going Negative on "Negative Feedback"
Even in the absence of new research on this topic, I am ready to stake my reputation on a simple intervention that I am convinced can greatly improve students' and the public's understanding of the concept of feedback loops. First, a quick reminder of what geoscientists mean by "feedback loops:" Feedback loops are when A causes or influences or determines B, and then B influences C, and then C in turn influences D, and so on and so on until eventually some X circles back around and influences A again. In a so-called "positive" feedback loop, the end result of the chain of influences is that over time the system as a whole moves away from equilibrium, in one direction or another, towards a more extreme condition. For example, in the diagram to the left below, any increase in the rate of evaporation leads to an increase in the amount of water vapor in the atmosphere, which leads to a stronger greenhouse effect, which increases the temperature of the atmosphere, which in turn increases the rate of evaporation, and so again around the cycle. Conversely, in a so-called "negative" feedback loop, the end result of the chain of influences is that the system as a whole tends to stabilize around an equilibrium position. If the system starts to drift or get pushed one way or the other, the feedback loop tends to pull it back from extreme states or behaviors. In the diagram to the right, increased water in the atmosphere leads to increased cloud cover, which increases the percentage of sunlight reflected away from the Earth (albedo), which leads to a decrease in the temperature of the atmosphere, which in turn decreases the rate of evaporation. The feedback loop concept is profoundly important, because negative feedback loops keep the Earth system sufficiently stable that complex forms of life, including humans, can exist. Positive feedback loops underlie many environmental problems, including loss of biodiversity, global climate change, and degradation of agricultural soils. The problem is that in popular culture and in some other professions, the terms "negative feedback" and "positive feedback" are widely used for value-laden concepts that are totally different from the way we have been using these terms in Earth Systems science. "Positive feedback" is widely used to mean "praise," and "negative feedback" is widely used to mean "criticism." 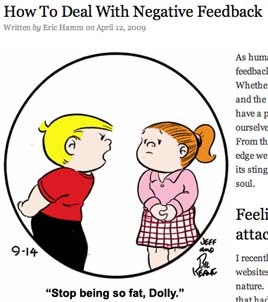 For example, by introducing his essay on "How To Deal with Negative Feedback" with the cartoon at the right, the author of the self-help website "Motivate Thyself" makes it clear that he is using the term to mean "criticism" or perhaps "criticism that comes out of left field." Here is a more confusing example, from a business website. 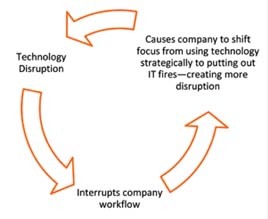 The original caption read: "Reactive 'Break/fix' Model: The reactive 'break/fix' model creates what we call the 'negative feedback loop' which disrupts business and destroys productivity." The diagram depicts a classic case of A causes B, and B causes C, and C causes more of A. An Earth Systems scientist would call this a "positive feedback loop," but the business site is using not merely a different term but exactly the opposite term: "negative feedback loop." Likewise, another example from a U.S. government website, at the National Institute of Justice. The accompanying text reads "Continual breaks in circadian rhythm can cause serious mental and physical fatigue. This fatigue diminishes people's mental and physical health, and impairs their ability to deal with stressful situations. For police officers, this gives way to a negative feedback loop that decreases their ability to perform their job effectively [emphasis in the original.]" These two examples carry even more potential for confusion than the "negative feedback = criticism" usage, because they visually resemble the systems dynamics graphic vocabulary of arrows and loops. "The negative feedback loop--foreclosures beget falling home prices, which beget foreclosures, further weakening the banks--is well under way. We hope the president's plan can break the loop, but without bankruptcy reform it is going to be a lot harder." New York Times editorial, 3 May 2009. We in Earth Systems Education are not going to win the rest of the world over to our usage by insisting that our meanings for "positive feedback" and "negative feedback" are the one and only legitimate meanings. The examples above show that elements of mainstream media, the government, business, and popular culture are all pulling the language in other directions. I cited "negative feedback" examples, but I could have given equally outrageous "positive feedback" instances, for example from here. By sticking our these time-honored but ambiguous terms, we are only making it more difficult for our students to grasp this critically important concept. "Balancing Feedback Loop":formerly known as "negative feedback loop"; a feedback loop that opposes whatever direction of change is imposed on a system, tending to keep reservoirs within a range of values, and tending to push the system towards stability. 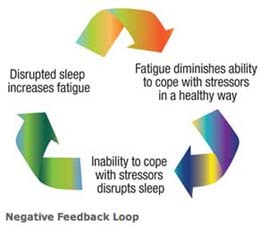 "Reinforcing Feedback Loop": formerly known as "positive feedback loop"; a feedback loop that enhances whatever direction of change is imposed on the system, tending to drive reservoirs fuller and fuller or emptier and emptier, and tending to push the system towards extreme states or behaviors. "Balancing" and Reinforcing," rather than "Negative" and "Positive," are the terms used throughout Dana Meadows' new book, Thinking in Systems, and to my eye and ear the terms work well there. "Vicious Cycle": a positive feedback loop which tends to push the system towards less and less desirable states or outcomes. "Virtuous Cycle": a positive feedback loop which tends to push the system towards more and more desirable states or outcomes. A strong case can be made that language shapes thinking. If that is so, and if we place a high priority on helping students think robustly about feedback loops, then we need to give them clear and unambiguous language with which to think. Kastens, K. A., Manduca, C. A., Cervato, C., Frodeman, R., Goodwin, C., Liben, L. S., Mogk, D. W., Spangler, T. C., Stillings, N. A., and Titus, S., 2009, How geoscientists think and learn: EOS, Transactions of the American Geophysical Union (subscription required), v. 90, no. 31, p. 265-266. Meadows, D. H., 2008, Thinking in Systems: A Primer: White River Junction, VT, Chelsea Green Publishing, 218 p.
The website on feedback loops linked in above is part of a larger SERC Website on Systems Thinking & Systems Dynamics. There is a workshop coming up on "Developing Student Understanding of Complex Systems," April 18-20, 2010, Carleton College, application deadline February 1, details here. I concur: this new language is more precise and less confusing. You've got my vote! Yes! I've seen this confusion so much in my Earth Systems Science class. I've been floundering around for terminology that is more intuitive. I also agree -- I've used 'regulating' and 'amplifying' in some cases, but these terms work great as well. My own students typically assign a value to the terms "positive" = good and "negative" = bad. This is totally unintended in the scientific use of these terms (nature is value-neutral in these matters, She just does what she needs to do to balance energy and mass), and obviously does a lot of harm with respect to students' understanding of natural processes. I use the terms "destabilizing" for positive feedback and "stabilizing" (self-regulating)for negative feedback. There is a nice discussion of this, along with some good figures in Merritts, De Wet and Menking, Environmental Geology An Earth System Science Approach, p. 51-52. You've got my vote -- feedback is both profoundly important for deep understanding of Earth system science and made profoundly confusing by the ways the terms have been used. When I wrote this post, I felt strongly, but intuitively, that having two different meanings for the term "negative feedback" was harmful to student learning of Earth Systems. Commenters above seem to agree. But at the time I had no conceptual framework into which to place my intuition, just the notion that "it's confusing." I have recently come across a paper that I think provides a way of understanding why this double usage of the same term presents such an obstacle to learning. In a new paper, Gentner (2010) writes about how human's use of language facilitiates our ability to think rigorously and insightfully about the relationships among things, and to recognize that two systems have the same underlying structural relations even though they may look different on the surface. Understanding feedback loops requires exactly this skill: to perceive that a thermostat and a predator-prey relationship have a structural similarity, even though they look totally different from each other. Among the facilitative mechanisms that Gentner describes is "naming promotes uniform relational encoding." This means that if an individual habitually encounters a specific term for a specific kind of relationship, this increases the chances that the "relational constellation" will be encoded into memory in the same way in different contexts. This in turn tends to foster the development of insights about all the different systems that contain that relationship as the person compares and contrasts the various systems. If the relationship is called by different names in different systems or contexts, the person is more likely to overlook the parallelism between the two systems, and miss out on an important kind of learning that comes from comparing and contrasting. It seems to me that a corollary of this idea is that if the same relational term is used for different relations in different circumstances or by different people, that this will present an exceptionally enormous obstacle to learning. It violates our expectation that the same relational term will mean the same thing in different systems or contexts. And a learner could waste lots of time and energy and good-will struggling to make a structural mapping between two systems that are fundamentally unaligned and unalignible. Gentner, D., 2010, Bootstrapping the mind: Analogical processes and symbol systems: Cognitive Science, v. 34, no. 5, p. 752-775. I read this when it came out, and really like your suggested terms- I am using Kump, Kasting, And Crane's "The Earth System" (2nd Ed.) this semester in my first-year seminar "Global Warming and the Science of Climate Change." The book has an excellent summary of Daisy World and some basics of systems theory, which I will enhance with your improved terminology. "Balancing" and "Reinforcing" are much more appropriate terms!